Little is known of the history of the church Sunday School in Wymeswold. It is known, however, that Sunday Schools first started in Britain in 1780 to combat illiteracy and impart religious instruction. Details of education in Leicestershire indicate that there were children attending Sunday school in Wymeswold in 1831. The number attending was: Anglicans 46, Baptist 140, Methodist and Wesleyian 115, and Primitive Methodist 20. The delightful photograph taken at the turn of the century shows the Sunday School children of St Mary's setting off on the yearly outing, which was probably a picnic in Charnwood Forest, and indicates its popularity at this time. Attendance prizes were given each year to the children. In the 1930s church Sunday School was also popular. The children attended each Sunday afternoon between 2.30 and 3.00 and learnt the weekly prayer or collect and said it to the teacher each week. The children were given an attendance stamp each week of a religious picture, collected on a yearly card, and at the end of the year prizes of a religious nature were awarded to pupils for attendance. An Anniversary Service for the Sunday School was held each year when the children, dressed in their best clothes, paraded around the church singing hymns to parents and churchgoers then sat in the front rows for a service. 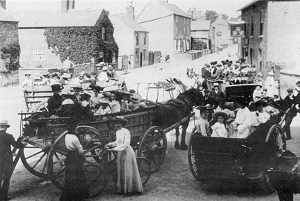 In the summer a tea party was held inside or outside the church school depending on the weather and sometimes a trip to the seaside was organised. For many years Miss Sue Kipling ran the Sunday School in Wymeswold. Sunday School attendance generally in Britain dropped off on the 1960s but a small group carried on in Wymeswold.